Mandee Rose	● Posted on July 20, 2018 July 20, 2018 ● 2 Comments on How to Fix VPN Error 868 – Fix the remote connection ultimately! With most VPN services, you click on a button on the website to download software and, once the file is on your computer, you just click on it to get the service installed. However, not all VPNs come with self-installing software. 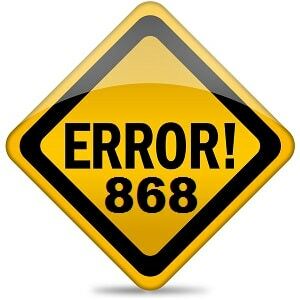 We teach you how to fix error 868 with the handy step by step guide below! Read on for more information. The perils of installing a VPN yourself while following instructions that were meant for technical experts is a little like trying to assemble flat-pack furniture. In the end you find there is a screw missing, or an Allen key that you don’t have. In the case of VPN installation, there is often some condition on your computer that hasn’t been accounted for, or the instructions don’t quite give you all the information you need. When computers go wrong, they sadly don’t pop up messages to tell you how to fix the problem. Instead you get an annoying error code, which, again, you need to be a technical expert to comprehend. “Error 868” is an example of this. What does it mean and what can you do about it? Read on to discover how to fix this irritating problem. 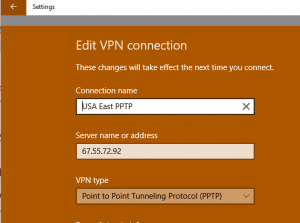 What Does VPN Error 868 Mean? 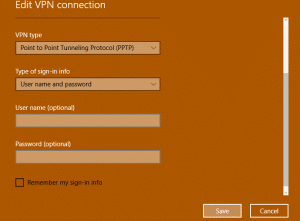 If you get a message with VPN Error 868, you are using a VPN for Windows 7, 8, or 10 and you have tried to set up a VPN connection through the Network Settings screen. The actual code “868” only appears in Windows 7 messages. Error 868: What Went Wrong? 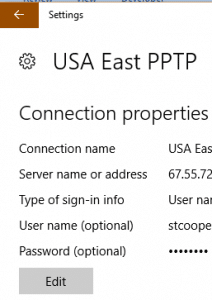 The server name you entered in the VPN setup page was wrong. If the name wasn’t wrong, then there is something wrong with the system that translates names into addresses. This translation system is called the Domain Name System, or DNS. Your DNS server may be local or it may be provided by your internet service provider (ISP), or it may be on the network that you are connected to. Everything on the internet has an address. This is called an IP address – the “IP” stands for Internet Protocol. A typical IP address looks like 192.32.32.44.3. Few people can remember these addresses, and so server managers create memorable names for them instead. This might be something like campus.1 or gbr.myvpn.sr. However, this is not the real address of the server, just a substituted name for that computer. When you get an 868 error it is because you either entered in the wrong server name, or the DNS server is having problems. This solution tries to fix the possibility that you may have spelt the server name wrong. It relies on you having access to the actual server address. If you don’t have the address, skip on to the next fix. Go back to the Network and Internet Settings page by pressing the Windows button and the “I” key together, then selecting “Network and Internet.” Click on VPN in the left-hand menu. Click on the name of the VPN connection that you set up. Click on the “Advanced options” button. Enter the actual IP address for your VPN server in the “Server name or address” field. Click “Save” and then try your connection again. Another possibility that could cause a connection to the VPN to fail is if you haven’t entered the correct username or password. Return to the setup screen for your VPN connection, as explained in the previous section. Scroll down to the username and password fields. If you are sure that you have the server name right, that your username and password are correct, and you don’t know the IP address, then you are going to have to deal with the DNS server. Press the Windows button and the “X” key together to get the list of system utilities. Click on the “Command Prompt (Admin)” menu entry. In the command prompt window type in ipconfig/flushdns and press <ENTER>. Type in ipconfig/registerdns and press <ENTER>. Type in exit and press <ENTER> to close down the command prompt window. Close down all other open applications and restart the computer. When the system comes back, start the VPN again and see if the problem has been resolved. Another fix that needs the Command Prompt is to restart the Remote Access Service Manager. 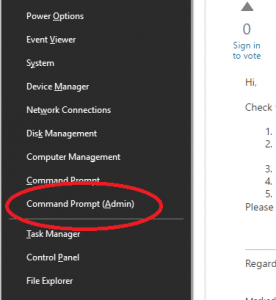 As above, access the Command Prompt in Admin mode. Type in net stop RasMan and press <ENTER>. Type in net start RasMan and press <ENTER>. Type “exit” and press <ENTER> to close the Command Prompt window. 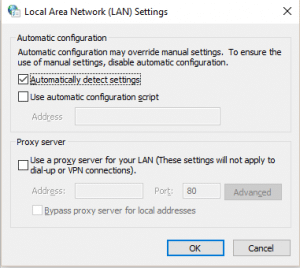 You computer might have a proxy server set up that is interfering with the operations of your VPN. You can clear this information with the following instructions. Click on the Start button and click on the cog symbol in the left-hand column of the menu. Enter “Internet Options” in the Settings window’s search box. Click on “Internet Options” in the list of results. This will open the Internet Properties window. Click on the “Connections” tab and press the “LAN settings” button. 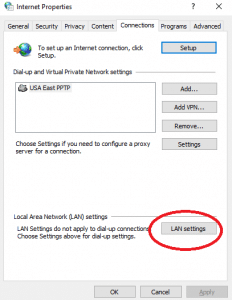 This will open up the Local Area Network (LAN) Settings window. Make sure that “Use automatic configuration script” and “Use a proxy server …” are unchecked. Press the “OK” button to close the window and press “OK” in the Internet Properties window to close that. Your anti-virus software or your firewall may be blocking the VPN connection. Access your anti-virus and turn it off. 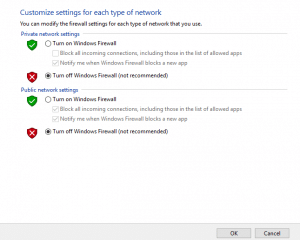 If you are using the Windows Firewall, follow these instructions to turn it off. Return to the main Windows Settings screen and type “Windows Firewall” in the search box. Click on “Windows Firewall” in the search results to open the firewall management window. Click on this to get to the Customize Settings screen. In both the private network settings and the public network settings sections, click on the “Turn off Windows Firewall” radio button. Click on the “OK” button to save the changes. Try the VPN again. Note the results of the trial and go back and turn your firewall and anti-virus software back on. If these protection programs cause you problems, contact your VPN provider and tell them this. They will be able to talk you through how to adjust your specific security software to stop it from blocking your VPN connection. In some cases, VPN support teams can actually take control of your computer and make the changes for you. If you have a laptop or a mobile device then pop out to a coffee shop or bar that has free WiFi. If you can turn on your VPN there without getting the 868 message, then the problem lies either with your router or your internet service provider. The chances are that your ISP gave you the router, so contact the helpdesk and explain the problem. If you still can’t identify the problem then you will have to raise a support ticket with your VPN provider. Explain the steps that you have gone through and the results you got from each trial. It is annoying when things don’t work like they should, and VPN Error 868 is one of those irritating, obscure messages that can ruin your enjoyment of the internet. VPN services that provide self-installing software rarely encounter connection problems, so if the service you chose requires you to manually set it up, then you are open to failure. Don’t be embarrassed about contacting the VPN support desk, because if you get this error, the chances are that lots of other users of that VPN have also had the same problem. This is not caused by anything that you have done wrong if you were just following instructions. 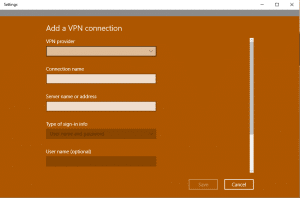 For more information about using a VPN for Windows see our Best VPNs for Windows Page. Alternatively if price is one of your main concerns, take a look at our best cheap VPN services guide for more information. Both obvious errors, but best corrected. no, this is not the solutions because you are solving a surface level but the problem is inside Windows drivers o kernel… you are in wrong way.